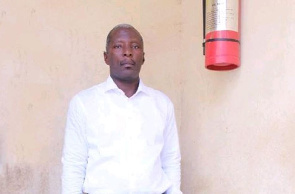 Jules Omer Tchuenkam found his family on Tuesday, April 9, 2019 after 10 years of pre-trial detention at Kondengui Central Prison in Yaoundé. The day of Monday, April 08, 2019 was very long for Jules Omer Tchuenkam, his lawyers and all those who wanted to live his release. His final departure from the prison was scheduled before noon. It was finally around 7 pm that the fifties had closed behind him, the sadly penitentiary where he lost ten precious years of his life. It was not easy. My procedure has dragged on. It's finally 10 years and 2 months that I spent in this building that you see behind month. It's a hell, I'm very lucky to be alive today. But, I'm not healthy. I have a tension at 16. I did not enter with the same tension. I have suffered from diabetic stress according to the doctors "confides the now ex prisoner to the journalists present at the time of his release. Asked about his future, Jules Omer Tchuenkam says that his priority is to find his family. "I really want to find my children who are in Douala and my mother who is on the side of Akonolinga". At the mention of his mother, he burst into tears. "A thought for my mother who is suffering today because of my imprisonment. I am his only son, his only child. But, I think that we will be satisfied with the essential thing which is my liberation". He does not forget those who handed him the pole. "I thank all those who mobilized for my release. I especially thank David Eboutou, my brother, Dominique Fousse and all his collective ". Successful businessman before his arrest, Jules Omer Tchuenkam will start a new life. He leaves behind him, an affair that began on January 23, 2009 when he was arrested for complicity in aggravated theft in Akonolinga, a locality in the Central Region. Despite the fact that he claims his innocence by stating that he is the victim of a trickster, he will be transferred to Kondengui prison in Yaoundé where he will spend ten years without trial. Thanks to the revelation of this story in February 2019 by the journalist David Eboutou and given the outcry that it raised, the case Jules Omer Tchuenkam was quickly enlisted for a first hearing on February 21, 2019, before his sentence on Tuesday April 2, 2019 to ten years in prison by the Military Court of Yaoundé. Just enough to make up for the time he spent in pre-trial detention.